This recipe was passed on to me many years ago by an old friend. It couldn't be more simple, really. Just canned sardines (the big cousin of the anchovy), some cream cheese and lots of fresh lime juice. You can substitute lemon juice if limes are too pricey. My friend used to make this bones and all, but in the interests of getting my relative (who doesn't like consuming bones) to eat it, I have removed the backbone from the sardines first. It's a simple thing to do, if a bit fiddly. Throw any chopped fresh herbs in that you happen to have on hand; I like either flat-leaf parsley or coriander. Sometimes I add some extra zing with capers or a little fresh chilli. Serve on thin slices of crusty sourdough or with a pile of crackers. Bones or no bones, it's a simple tasty dish suitable as an entrée, a party dip, or a light lunch accompanied by a leafy green salad. Drain sardines and reserve oil; remove backbones with a knife. They should come out easily. 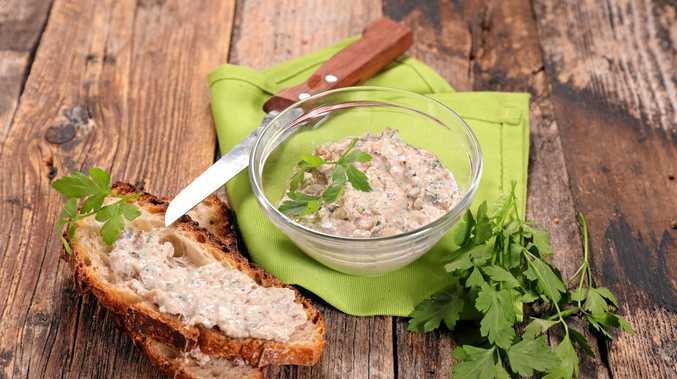 Place sardines in a bowl and mash with a fork. Add cream cheese, lime juice and zest, chopped herbs and about a teaspoon of the reserved oil from the cans. You can keep the remainder of the oil to use in a marinade for barbecued seafood or use sparingly to flavour a Caesar salad dressing. Mix well, and season to taste with salt and pepper. Cover and refrigerate for at least an hour to allow flavours to develop. Serve with sourdough toast or crackers.